My own introduction to this field of Energy Saving Solutions . . .
began in 1977 when I worked for a company (called Sonoma Solar) in northern California that was testing and manufacturing energy saving products for the marketplace, like parabolic solar collectors. These collectors used water as a heat collection medium and were designed to track the sun’s travel throughout the day while receiving its radiant heat. The system was simple enough: the parabolic shape was created by making up two matching sides that were placed opposite of each other to form the parabola. These were made of plywood frames and fastened together using a set of hinges at the center of the shape (the hinges allowed them to be handled more easily and shipped in the folded position). When assembled for use at the site, the open side of the parabola was held at a fixed distance apart by metal brackets. The reflective surface of the parabola was created by using sheet metal that was fastened to the frame after it had a reflective sheet laminated to it. The parabola was then focused onto a flat radiation collection tube made of copper, which was suspended in the center (at the ‘focus’ of the parabola). This was specially manufactured with a ‘puffy’ waffle pattern for the water medium to flow through it (like a car’s radiator) and the outside surface was coated with a nearly 100% absorptive black paint. Water was run through these collectors and then into a collection system. The water temperatures easily went up to the boiling point and had to be mixed for domestic use, besides allowing for the expansion of the liquid. The units used simple motors to move them in accordance with input from sensors. The assembled units were mounted on pivot support frames to accomplish the rolling necessary to track the sun. Laundromats seemed to be the industry best suited to this type of system . . . partly because of the high initial cost of installation and partly because of the tremendous need for lots of very hot water especially during their busy daytime hours. The ideal shape for a collector of this type is really a partial ellipse (because an ellipse has two specific foci – one being the sun, the other being the collector that receives the sun’s radiation from the reflective shape created around it), but the reality is that the size of the sun and its distance from us makes the precise shape less relevant for this particular use. A parabola is more-or-less the same shape as the shiny reflector that you find in any common flashlight – it focuses the light from the bulb in a particular direction. That was where I ‘cut my teeth’ on the idea of energy conservation. Since then I’ve tried to incorporate at least some form of energy conserving system into most of the projects that I’ve been involved in constructing. Here are a couple of articles that I have located which show that even the ‘newest’ energy saving ideas aren’t really that ‘new’ after all. The Popular Science magazine referred to happens to be one that I’ve had in my library since it first arrived in my mailbox back in 1979. This article is from the Dec 1979 Popular Science. It’s a Double-shell Solar House (see pages 54 and following – pull the slide button on the far right of the screen downward until you’re approximately 1/3 from the top. The page indicator will probably read “Page 15”; the first page looks like the screenshot): Double-shell ‘Solar House’ Note the magazine’s cover picture as it’s a cut-away of the home and shows how it works. And, in the body of the article note the preconditioning tubes shown in one photo and two of the sketches. These are used to pre-warm the winter air, and pre-cool the summer air, before it is introduced into the home as fresh air. They work because the ground is a ‘heat-sink’ and doesn’t change temperature more than a few degrees from summer to winter, although the depth of that more-or-less consistent temperature may be quite deep depending on where you live on the planet. Where I live it is only a few feet below the surface of the ground. So, . . . in the winter the very cold air is given a boost in temperature by the warmer ground around the tube, while in the summer the hot air looses some of its heat to the ground. The crawl space in this type of home becomes a conditioned space (i.e. treated much like the living space as far as temperature and air quality) and the perimeter outside of the concrete foundation is shown insulated to help keep the temperature more constant. The ground under the home is usually sealed and is used as a heat sink to keep the temperature more even while the temperature outside rises and falls. 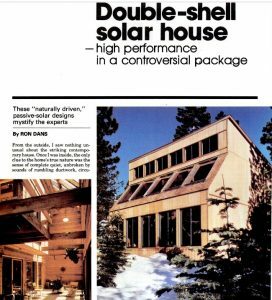 One question came up in a subsequent Popular Science edition in the Readers Talk Back section, under ‘Double-shell houses’.